Burger fan? Me too! 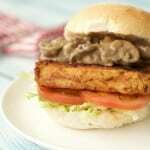 Have you ever seen anything more yummy looking than this here tofu burger? Oh Em Gee! It tastes as good as it looks. For reals. 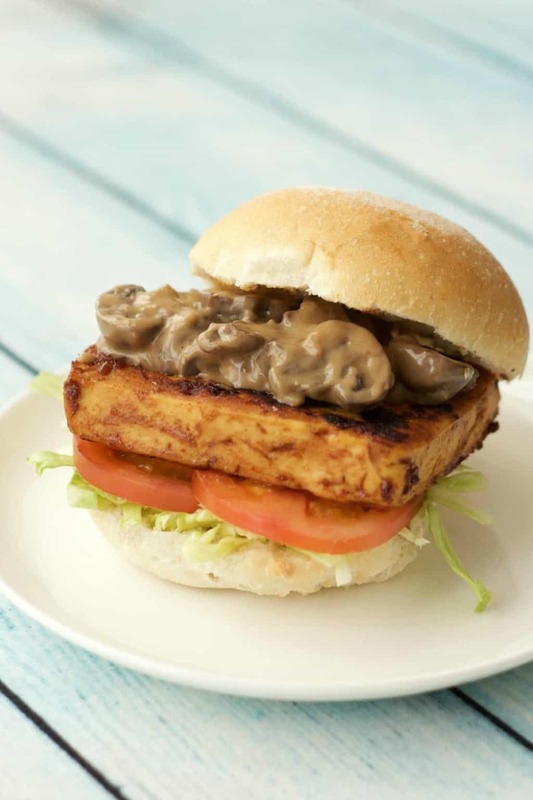 To get this burger to this exact stage of deliciousness, the tofu is first pressed, then cut into (enormous) slices (more on that later), baked until crispy, then marinated in the most glorious sauce. 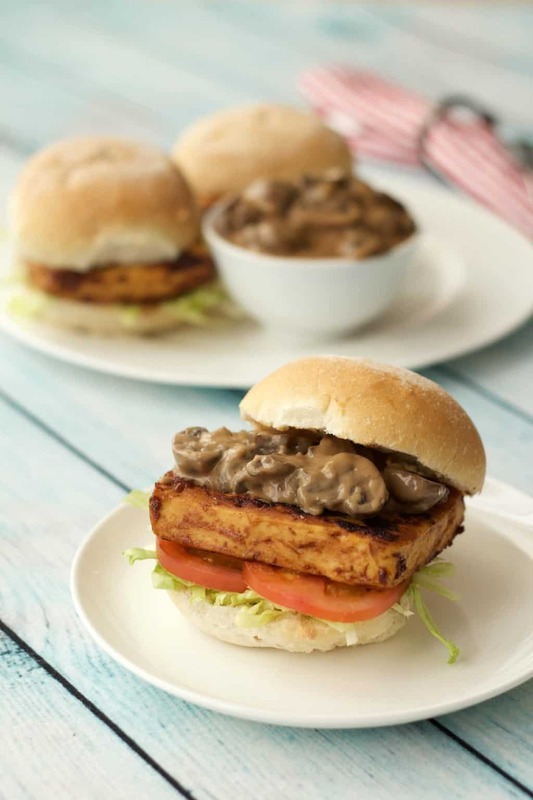 Then it’s fried in its marinade sauce and put on a bun with lettuce and tomato and then topped with the most decadently creamy mushroom sauce your tastebuds have ever encountered. Want heaven in a bun? This is it. So…I recommend a tofu press for the tofu pressing part of the equation. We only recently got one of these and it is da bomb! Luuuurve it. 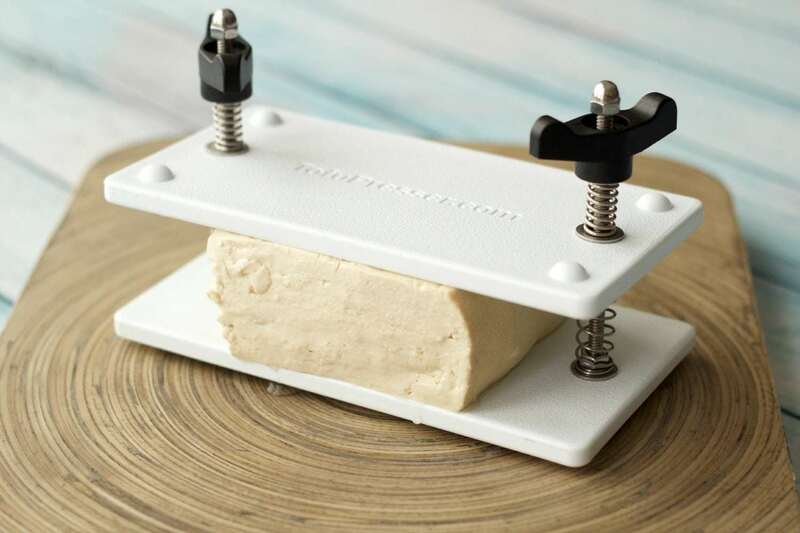 If you don’t have (or don’t want to get) a tofu press, then just press your tofu by putting something heavy on top of it. Then slice it lengthways into big fat square burgers. As you can see, I sliced this block of tofu thick. And the slices are not just thick, they’re wide. I’m all for the mega tofu burger, but truthfully, this block of tofu could have made at least 4 tofu burgers, rather than the 3 I did make. And while we’re talking about it, this was a large block of tofu too. An 18 oz block to be exact! It’s more common to find smaller blocks of tofu – like 12 oz or even 8 oz. So, basically, just slice it as thick as you like and get as many tofu burgers as you want/need out of it. How thick your tofu is or how many burgers you make, doesn’t really impact the recipe instructions too much. Any leftover mushroom sauce you can eat later, with literally anything. It’s SO good. And you’re going to want to make this mushroom sauce again, I guarantee it. You’ll be wanting to just whip it up and dip your fries in it, dip your veggies in it, eat it on toast, eat it on crackers, eat it with a spoon, just eat it. A lot. 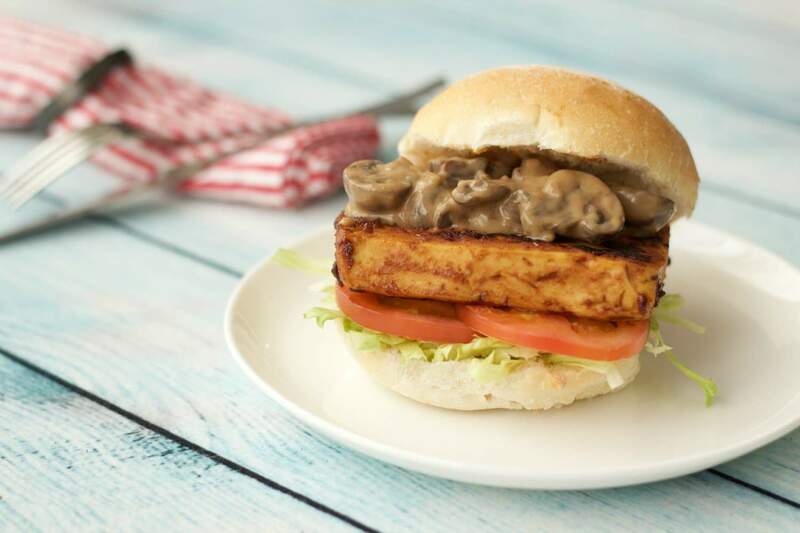 Basically, you’re going to love this delicious vegan tofu burger, the tofu, the sauce, the whole enchilada….er… I mean burger. 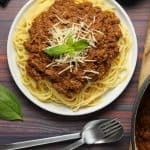 And when you make it and love it and want to eat it every day, please come back here to the blog and leave a comment and rate the recipe too! Not to mention taking a photo of it and tagging it #lovingitvegan on Instagram because we go nutso over seeing other people enjoying our recipes! Also check out our vegan chickpea burgers if you’re getting on the burger train, and if you want some fries with that, then our baked potato fries will go perfectly! 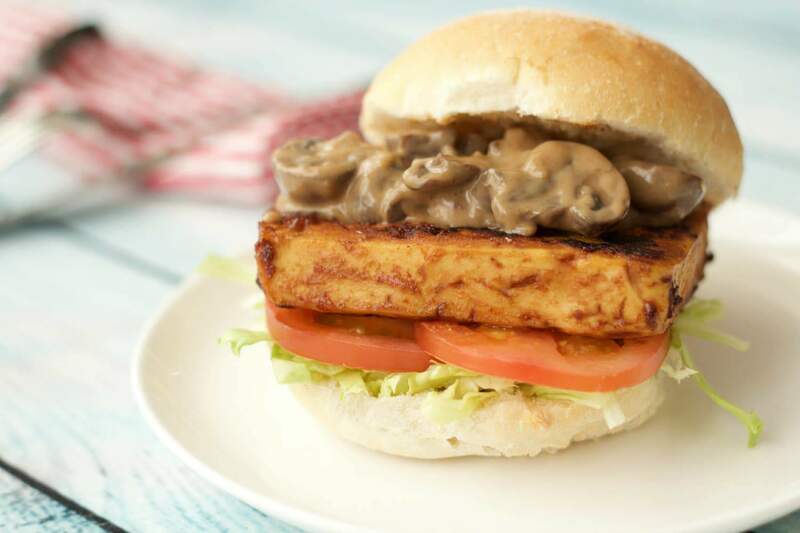 Baked and marinated tofu served on a hamburger bun with lettuce, sliced tomato and the richest, creamiest mushroom sauce. A real treat for burger lovers. Flavorful, savory and deliciously satisfying. Press the tofu for 20 minutes either using a Tofu Press, or by wrapping it in absorbent towel and placing something heavy (like a heavy pot) on top of it. When pressed, cut the tofu into thick square burgers. 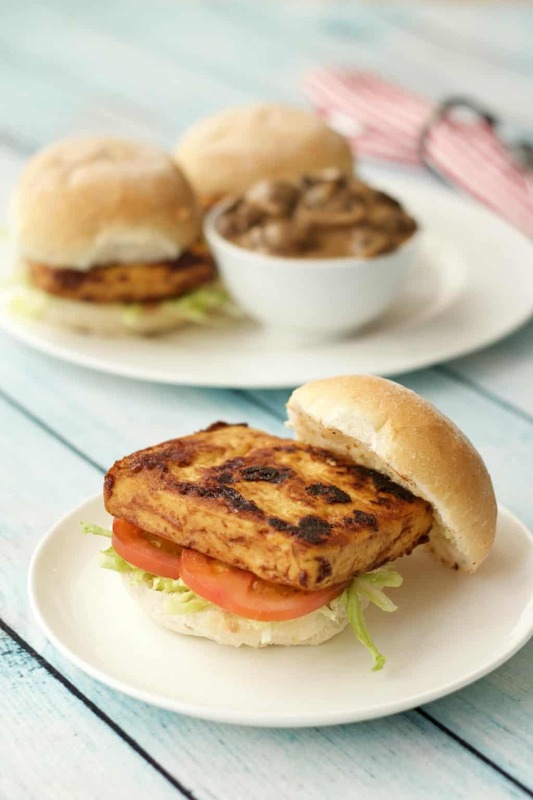 Place the tofu burgers onto the parchment paper and bake in the oven for 40 minutes, turning the tofu over after 20 minutes. Mix the marinade sauce into a bowl. 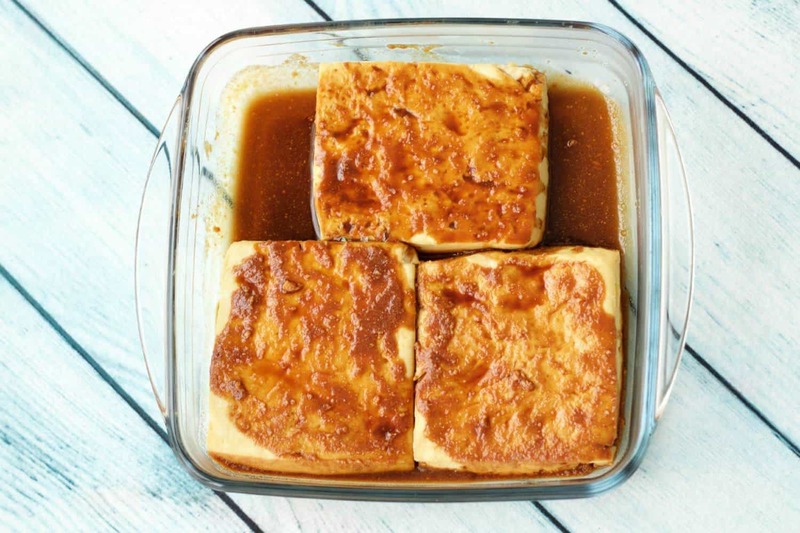 When the tofu is finished baking, place the tofu into a dish and pour the marinade sauce over it. 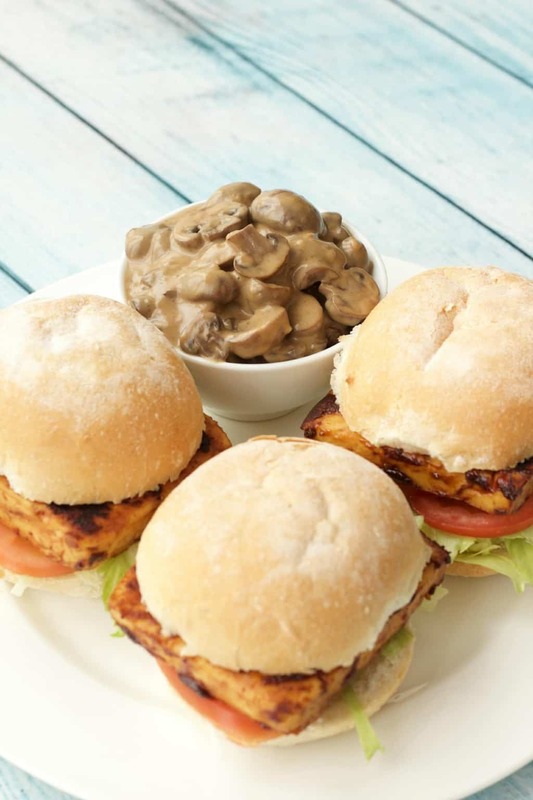 While the tofu is marinating, start your mushroom sauce. Chop the mushrooms and add to a pan with the 2 Tbsp Soy Sauce. Cover with a lid and turn the heat to medium high. When the mushrooms release their water and are bubbling away remove the lid and let the water cook off. When the water is mostly evaporated, add the coconut cream and simmer for a minute. Then mix the Tbsp of flour with a small amount of leftover coconut cream (or water) into a thick paste. Stir it into the sauce. 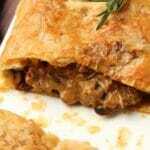 Allow to boil for a couple of minutes after adding the flour to further thicken up before removing from the heat. 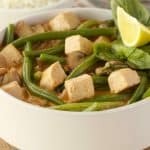 While the sauce cools, heat a pan on the stove, and then remove the tofu from the marinade sauce, using a slotted spatula so that most of the sauce remains behind and place it into the frying pan. Brown the tofu a few minutes on each side, until properly browned. 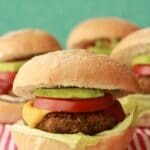 Prepare your hamburger buns, adding lettuce and sliced tomato. 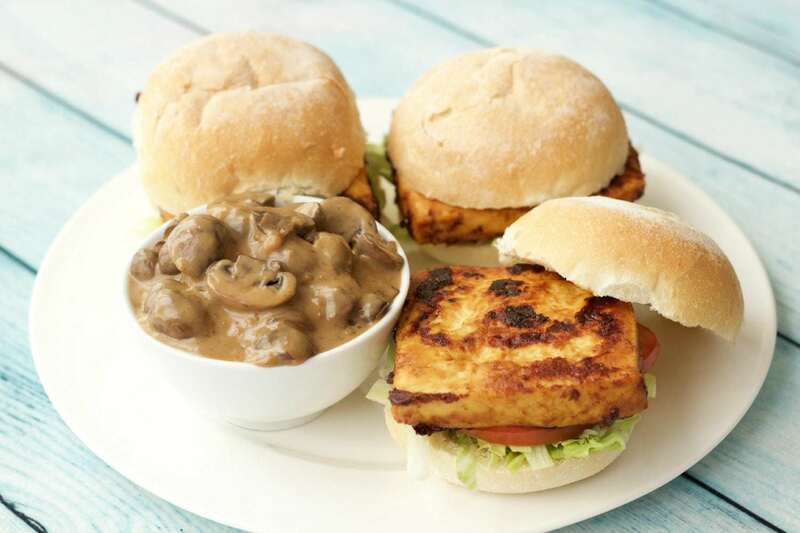 Add the browned tofu burger on top, and finish up with some mushroom sauce, or serve the mushroom sauce on the side. 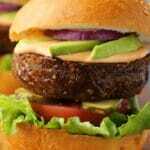 *The baking time for the tofu may be less, it depends on how thick your tofu burgers are. *We used an 18 oz block of tofu, but any good size block of firm tofu will do. *Nutritional Estimate is based on 1 burger of 3, including bun, garnish and a generous amount of sauce. 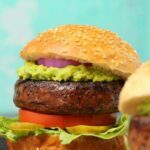 *You could easily get 4 burgers out of this recipe with an equivalent size block of tofu, by cutting the tofu slices a bit thinner. So good to hear Marida. 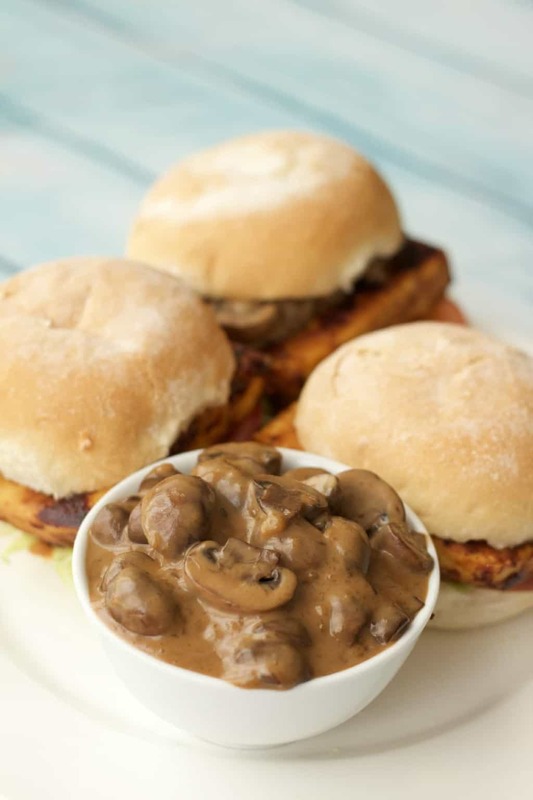 Same here with the mushroom sauce, it’s like major willpower to put it on the burgers and not just eat it all straight out the pan! It’s SOOO good. This looks great! I’ll definitely give it a go. Sorry to ask a silly question, but when it says about ‘browning’ the tofu on both sides – what does this mean? Back in the oven? Under the grill? In a saucepan? These burgers are sooo good! The sauce is so amazing, I’m definitely going to be using it for all kinds of things from now on! Hello, is there something I could use other than the peanut butter in the marinade? Sunbutter, maybe? Thanks!